When I first receive most new games, I rarely know what to expect just from looking at the box. Sure, Infocom's probably contains a work of interactive fiction, and SSI's an engaging simulation/adventure, but these are the exceptions. Another exception is any game that belongs to Epyx's Masters Collection. These games are sure to feature a challenge—one which, realistically, might never be surmounted. Space Station Oblivion provides just that. The manual opens by setting up the scenario, although, as with most arcade games, the rationale for your struggles is best forgotten. Regardless, for those who are interested, it seems that your world has, through the lack of proper planning and rampant, uncontrolled development, accumulated a core dangerously full of natural gases. Your mission is to place a drilling rig in each of the 18 platformed sectors and safely vent the trapped gas into the atmosphere. Thus, the game is a race against time to first locate each sector, then identify the proper place to drill. Complicating your life are a limited energy reserve and a whole slew of security devices. Your craft is an excavation probe, which derives its power from the energy stored in the Rubicon crystals strewn about the planet. Needless to say, one main strategy is to find and secure an ample supply of these crystals, buying yourself enough time to complete the game. But not too much time, as you have only four Mitral hours to complete the mission. Moving, firing your laser or drilling for gas uses up energy, while numerous tricks and traps must be solved or avoided to gain access to necessary areas. For instance, switches, when hit by a bolt from your beam laser, open doors and dissolve energy fields. Hidden teleporters transport you to unexplored sectors, and hidden somewhere on the planet is a reconnaissance jet. Locating and flying this craft will allow you to chart Mitral's many areas. The sheer variety of the conflicts is likely to keep most players engaged for months. As with most ST arcade-style games, Oblivion's graphics shine. 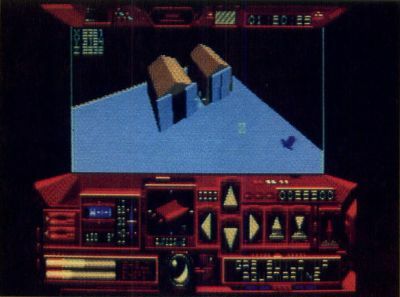 Although the blocklike vector graphics that outline Mitral's features are standard stuff, the image of the ship's control panel is dazzling. The ship seems so real you can almost feel the burnished steel of the command console, almost sense the vibrations emanating from its power plant. You control the game either with the keyboard or the mouse (the mouse is recommended). Moving the pointer across the command console accesses such options as game save, as well as allowing movement of the probe and positioning of your drilling rigs. Detailed readouts and indicators keep you apprised of every crisis. Thoughtful design and programming make control simple and intuitive, allowing even the new player to direct his full attention to the formidable task of completing his mission. The manual concisely explains every feature of the game, but provides few hints. For those who are unable to complete the game, Epyx has a hint book that includes not only Oblivion, but also Sub Battle, LA. Crackdown and The Legend of Blacksilver. Space Station Oblivion gets good marks for its overall challenge and smooth execution. The only drawback is the lack of detail in the planet's graphics, which compare poorly to the high detail of the command interface. 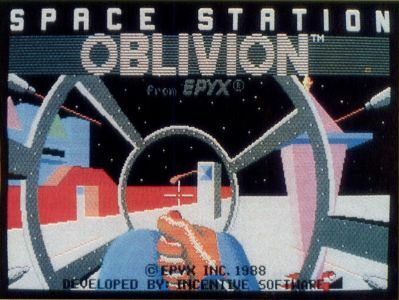 Space Station Oblivion is guaranteed to occupy your disk drive, and your time, for months to come.